We know your appliances better than anyone! Our parts department compliments our award winning service department and vice versa! Call us with the model and serial number and we can ship the needed part to you the same day. Knobs, filters, hoses, venting, odor removers, silverware baskets, door gaskets, thermostats, timers, heaters and every other part for all your appliances are available from our parts department. If we don’t have a part in stock, we are normally able to order and have it shipped directly to you within 48 hours! Call now at (410) 682-3232. Same day or next day shipping available on most parts! No matter what the brand name of your appliance, we can supply you with the part. We stock parts for all major brands, including Maytag, Whirlpool, General Electric, Sub Zero, Frigidaire, Sears, Kitchen Aid, Amana, Westinghouse AND MORE. If we don’t have it, we can get it for you quickly! We also sell parts for the hard to get brands, including Sub Zero, U-Line, Carrier, Insinkerator, Litton, Caloric, and ALL the rest! If they still make it, we can get it for you! 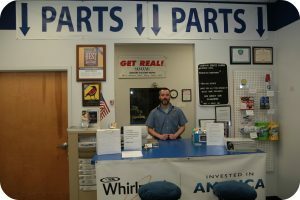 E-mail or call 410 682-3232 ext 100 for the Parts Department… We’re Quick to respond!! No matter where you live, we can get the part to you very quickly, normally within 48 hours. We understand the importance of fast, reliable service for our customers. We take great pride in our ability to deliver your parts fast! Call your order in by 3:30 pm EST and we’ll ship the part out by UPS the same day!! Next day Air and Priority deliveries are also available for emergency parts needs. Saturday Parts Department is closed.